A garden hose reel can be something far more special than just an item to store your hose on. It can be aesthetically appealing and convenient, doing a lot of the work for you and making gardening or yardwork a lot more pleasant. We want to show you a few of the very best garden hose reels and teach you a how to find the best one for your needs. How it fits- There are all sorts of great garden hose reels, and some of them are quite fancy, while others are simpler and more practical. You have to think about how the reel will fit with your yard, patio and the rest of your outside décor. Longevity- One of the best reasons to use a hose reel is because it makes your hose last longer. It gets rid of kinks and bends and ensures that your hose is preserved and works far better for longer. Budget- You probably don’t want the most expensive hose reel out there, but you also don’t want to just get a cheap one simply to save some money. You should look at this as an investment, and for a good investment, you need to spend some money to get a quality product. Just don’t go overboard and buy something expensive just for the sake of getting something expensive. 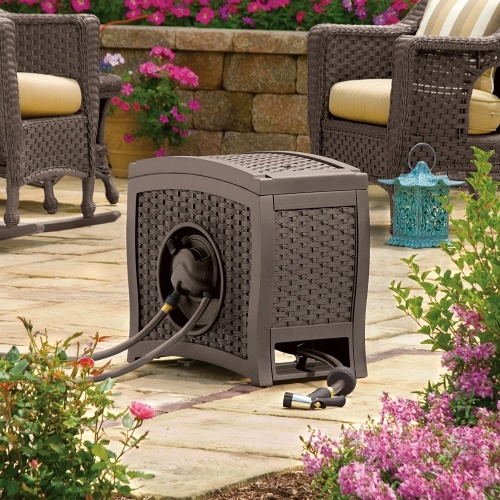 How much hose it can hold– You’ll want a hose reel that’s big enough to fit whatever size hose you have. Pay attention to the limitations of the hose reel and compare that to the length of hose you have on hand or that you are planning to buy. Check the source– Not all garden hose reels are built to last. Some are made from low quality materials, light metal that will wear down quickly and won’t do very well over long periods of time. You have to weed out the low-quality stuff and go for something that is made to last, if you want a decent return on your investment. Size– This is one of the key factors when deciding on which hose reel to buy. Not all units are lightweight and portable, and you need to keep that in mind when you are trying to find the right one for you. Look at the dimensions before you click that “buy now” button. Here are some of the best garden hose reels available. One of the best features of this Suncast model is that it offers easy rewinding with the flip of a single lever. It’s so easy to get your hose back in place and have a tidy yard when you are done working with it. 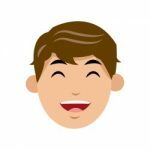 You’ll love how convenient it is and how consumer-minded the entire package is. It can handle up to 125 feet of hose, so keep that in mind as you make your purchase. You don’t want to end up with a reel that is too small for your hose. On the downside, while the main product and its base are made from quality resin that’s incredibly durable, the inner wheel and gears are not as durable, and they can bend over time. That’s something to keep in mind as you determine whether to get this product or not. 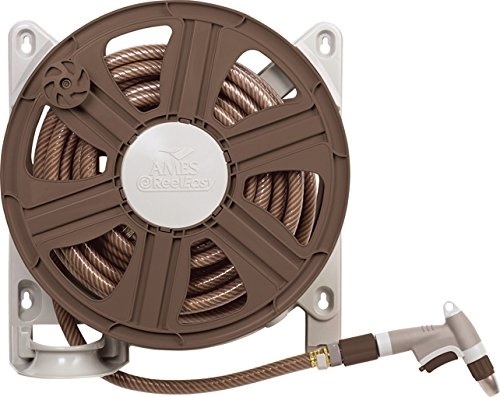 If you don’t want all the features and style that many of the other hose reels offer, then this simpler, more durable reel may be right for you. This is a metal reel that is going to hold up to a lot of abuse. You don’t have to do much maintenance on it or worry that it will break down after extended use. The only issue with it is to ensure that it is bolted down or otherwise securely fastened before you start using it. That’s because it is very heavy, and it is going to cause problems for you if it is not fastened securely. It’s so simple to use and basically foolproof once it is secured. The other hose reels on this list are going to warp or break apart over time, but this one is built to last for very long, and you can probably expect to use it without any problem for years. It’s more expensive than the other options we have listed, but it is also a sound investment. The price tag may make it an expensive choice for some, but for those who have the money to spend on it, it is a great hose reel. Suncast hoses are considered among the very best in the industry, and they get top marks from many experts in several categories. This particular model is affordably priced and designed to be very easy to use. It comes with stakes you can use to keep it firm in the ground as well as a base that swivels, so you can easily unwind the hose. That’s far easier to use than something that is rigid and snags the hose, creating kinks and extra work for you. The simple boxy design and subdued colors ensure that it fits well in most environments without standing out too much or clashing with the rest of your décor. The only real downside to this reel is that it is not made of high quality parts like some of the others on this list. There is a chance that it will start to break down or wear out quickly if you are not careful with it. That is something to consider when you look at this more budget priced reel. This reel from Liberty Garden Products is a nice compromise between the more expensive options on this list and the cheaper ones. It’s kind of pricey, all things considered, but the investment can definitely be worth it. You are paying for a quality, steel hose reel that can handle the abuse and keep on working without problem for a very long time. It comes assembled, so it has an advantage compared to the Eely hose reel, and it can manage up to 125 feet of hose without any issue. 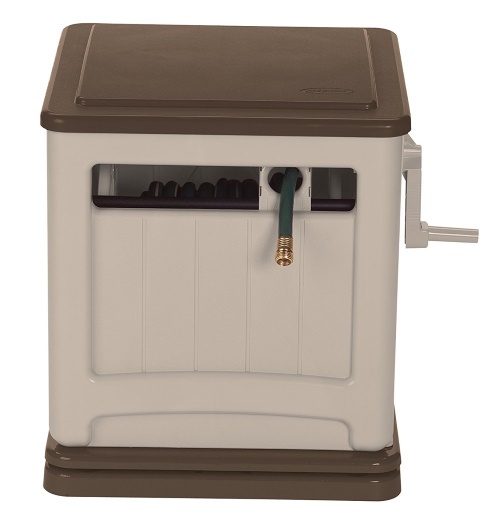 It even comes with a shelf to store nozzles and other hose parts on, and it is well designed and attractive. 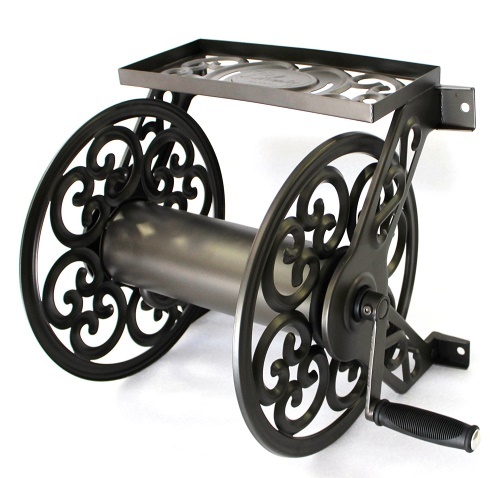 This hose reel will go well with many types of yard décor and exterior items you may have around. It is stylish and functional, giving you the best of both types of hose reels. This is a fairly economical choice that holds up to 100 feet of hose. It is attractively designed to fit with standard garden and exterior décor, and it is fairly sturdy too. The hose reel comes assembled, but you will need to find a place to mount it. 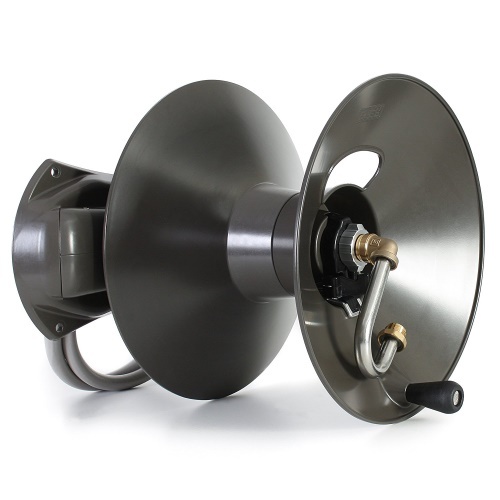 This NeverLeak hose reel has been crafted to be easy to mount wherever you like, so that should not be an issue. It also comes with a leader hose, so you get a lot of value for the price tag. It has the potential to warp or crack over time, and it is not the most durable product here, but it is of decent quality. If all of these options are more expensive than you would like, there are some cheaper alternatives, but they are not classified as hose reels or they don’t offer the kind of functionality that these more attractive and robust reels offer. It is recommended to use extension cord holders and other similar items to provide more affordable reels for your hose, and you should know that you don’t have to spend a lot to get just the basic features and functionality, if that is all you really need. 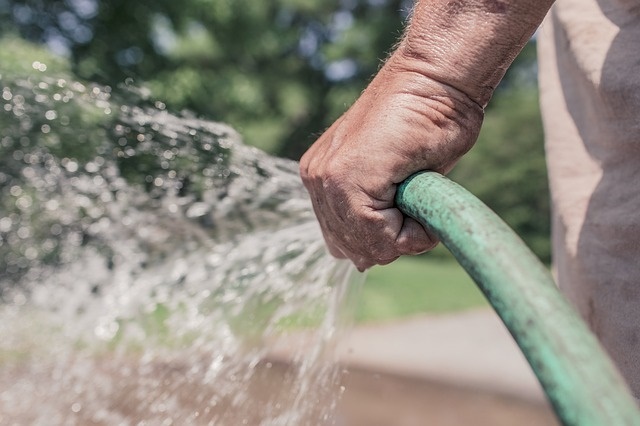 We hope you find what you are looking for with one of the options we have listed here and that it makes your hose use easier and more convenient.